The accommodation listed below represent those resorts in Phi Phi Island which are unlikely to disappoint and we offer the opportunity to book them at the guaranteed best prices. This iconic destination is as close to paradise as what our imaginations can take us with incredibly white ribbons of sand waiting to excite your senses. Whether you want to be away from the crowds in cozy bungalows on a private beach or right in the thick of it, we have the perfect place for you. Tonsai Bay is the main port of entry point and centre of activity featuring a host of budget hotels, a multitude of restaurants, nightlife and vendors selling curios, clothes and souvenirs. On the opposite side of the island is Loh Dalam Bay. 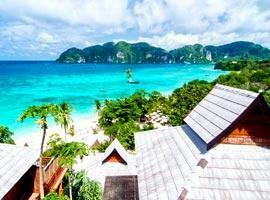 It is within walking distance of Tonsai, but outside earshot of noise and sport beachfront hotels like Phi Phi Cabana on a flawless ribbon of sand. 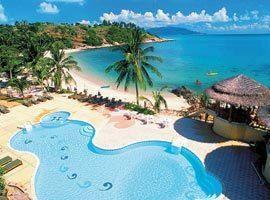 To the northern tip is Laem Tong which is perfect if you prefer seclusion and the epitome of luxury. Here the beach villas of 5 star resorts like Zeavola and Outrigger Village Resort located on an exclusive beach in Lo Bah Khao Bay are romantic havens of tropical indulgences with a befitting rustic tropical design, luxurious accommodation and breathtaking views. 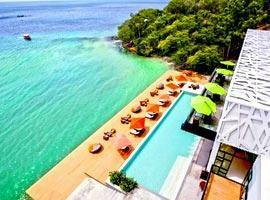 Arayaburi is located in Laem Hin which is within easy reach of attractions and nightlife in Tonsai. It flows down a hillside right to the waterline and offers deluxe rooms, many which are inter-connected. Holiday Inn features romantic accommodation for couples in charming beachfront bungalows and studios with private outdoor showers. Yet its also great for families by offering a kids club. PP Erawan Palms is located on the furthest northern tip of the island and ideal to enjoy the glorious surroundings without hindrances. 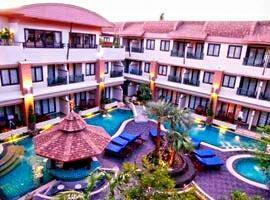 Offers air-conditioned deluxe rooms with private balconies. Located near entertainment it offers rooms with direct pool access while rooms on the 1st and 2nd floor have private balconies with pool views. Also offers a swim-up bar and reataurant. If you were looking for cheap hotels near nightlife without having to worry about accommodation standards you will do well with PP Andman Legacy. 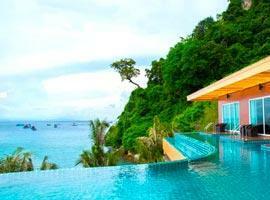 It offers rooms with charming pool or mountain views. The charming villas of Bayview Resort all offer private balconies equipped with sun beds and all allow breathtaking views of Tongsai Bay. It is located on a hillside snug amid trees and exotic plants. 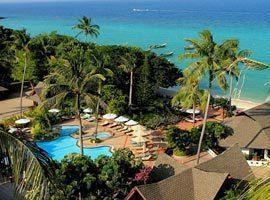 Offers budget accommodation close to entertainment and recommended for younger travelers. We recommend rooms in the west wing which are air-conditioned and offers ocean or mountain views. Combine the best of both worlds by enjoying utter tranquility at your base while being within easy walking distance of entertainment and nightlife. For families the Andaman Suite offer 2 bedrooms. 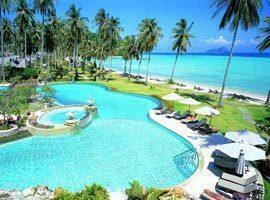 Phi Phi Island Village is a 5 star hotel with a private beach. It offers villas with private pools, charming garden bungalows and spacious junior suites. 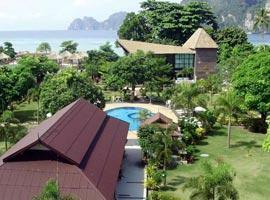 A key feature is its Gold Palm PADI certified dive centre. Proof you don't have to splash on luxury resorts to enjoy a private pool as well as a pristine private beach. Also offers family friendly accommodation in 2 bedroom cottages with your own pool. Located between Loh Dalam Bay and Tonsai Village you can be in the action in no time or choose to relax in tranquility on cotton soft sand 60 meters away. Offers free standing cottages or building rooms. Zeavola is the most romantic hotel on the island and located right on the beach amid utter tranquility. 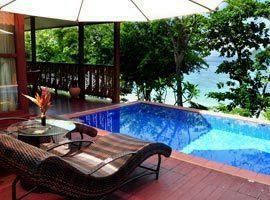 It offers private pool villas surrounded by lush tropical foliage allowing spectacular ocean views.